Money in the Bank [Number Power] © 2004 Konami Corp.
Money in the Bank is a 5-reel multi-line game that incorporates a free spin bonus event, a Keno mini-game and a progressive jackpot. The symbols have been updated on this game and differ from the original version. All pays are left to right except scatters which pay any. Banker appears on reel 3 and substitutes for all symbols. 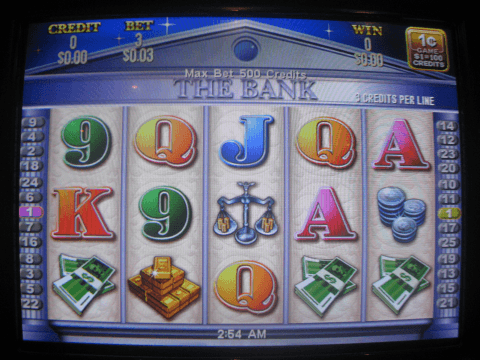 All wins with the Banker substituting are doubled, except for scattered Safes. * Banker's Respin: Whenever a Banker appears alone or with one scattered Safe, you are awarded one respin for an attempt to win the free games feature. Only the scattered Safe is counted on the respin. * Number Power Feature: When the Banker substitutes for a scatter win, the Number Power feature is awarded. During the Number Power feature, the player must choose one of four cards, which will have a random number of draws ranging from 20 to 60. The number on the face of the card determines how many numbers will be called out during the Keno mini-game. During the Keno mini-game, twenty random boxes from 1-80 have a coin in them. A female caller will flash random numbers similar to a bingo game. Alternatively, you can press 'Take Win' and it will unveil all items at once and will award the feature or jackpot. Any coins unveiled awards the free games feature ranging from 5 to 25 free games, or a progressive jackpot; if the player unveils no coins at all, they will be awarded 25 free games. During the free games, all wins are doubled and prizes pay from both ends. Free games and scatter respins can also be won again during the feature. If the Banker substitutes for a scatter win during the feature, 10 free games are added as per the original game. The Number Power feature cannot be won during the free games.